Dedicated to Ron Cooke. A true and dear friend, a true and dear comrade. The Arm The Spirit Archives is an online archive preserving the history of left-wing / left-radical / revolutionary / autonomist / anti-imperialist / militant protest movements. Its owners, contributors, and designers are not responsible for actions taken by third parties which may be harmful or unlawful to the individuals or entities named in archived publications. This web site is provided for the purpose of historical research and analysis, and is not intended to incite, encourage, or condone any criminal action on the part of its readers. Finally, The Arm The Spirit Archives does not necessarily agree with any of the views expressed in the publications in our archive, but aims to provide a thorough collection of the history of left-wing / left-radical / revolutionary / autonomist / anti-imperialist / militant protest. All opinions expressed in our archives are those of their original authors only. Arm The Spirit (ATS) was an information collective, based in Toronto, Canada, focusing on militant and revolutionary struggles. 17 issues of Arm The Spirit were published, as well as 4 smaller Arm The Spirit Info-Bulletins. We also published other material on occasion, including several issues of a “Kurdistan Solidarity Bulletin” and pamphlets on guerrilla organizations, political prisoners/POWs and anti-fascism. 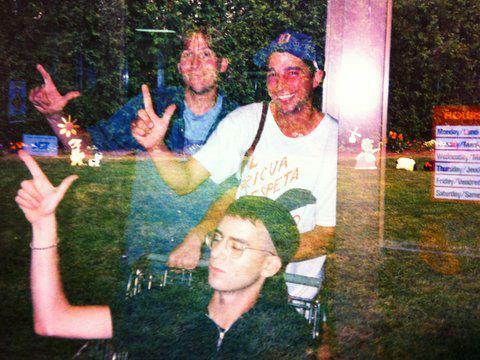 Over the course of our 10 years, we amassed quite a collection of written material and are now attempting to make some of this documentation available online. We will be posting selected documentation from the ATS archives to the web. 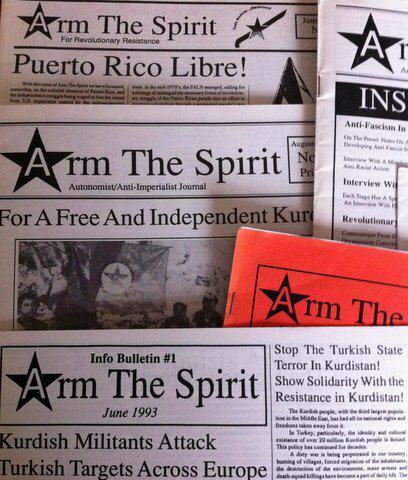 A decade has passed since the first issue of “Arm The Spirit – For Revolutionary Resistance” was published. Ten years on and a new millenium is a good a time as any to reflect back and look at what we’ve accomplished with this project and where we hope to go. In the late 80s a small group of us had been doing solidarity work around political prisoners in the U.S., particularly around anti-imperialist guerrillas – the “Ohio 7″ and the “Resistance Conspiracy Case” – who were on trial for seditious conspiracy and other charges. At that time there was a few magazines (Resistance, The Insurgent, Breakthrough … ) that published documents from armed groups but they came out infrequently and some were in the process of ceasing publication (indeed none of them are around today). Also much of the solidarity work around the trials mostly consisted of a “right to a fair trial”, denouncing repressive measures in the courtroom, etc. We wanted to do more than this in our solidarity work by focussing on the political aspect of the armed struggle by disseminating documents from the armed groups and other related material. So in June of 1990 we started with a small 4-page bulletin that quickly grew in size over the next few years. The aim of ‘Arm The Spirit’ was never to place excessive political importance on armed struggle, even though the content of the magazine was largely comprised of communiques from guerrilla organizations and discussions about the aims and means of armed resistance. But we felt that there was a need, particularly in North America, for a publication which offered a forum for such information. Although most clandestine resistance in North America had been defeated by state repression by the mid-1980s, the armed left was still very much alive and well in Europe when ATS began publishing. Early issues of ATS, for example, devoted a great deal of space to the armed anti-racist actions of the Dutch organization RARA, communiques from Germany’s Red Army Fraction (RAF) and the Revolutionary Cells/Rote Zora (RZ), the Basque organization ETA and the Spanish guerrilla GRAPO, and so on. We wanted the left in North America to be informed about the actions by, the politics of, and the discussions within such movements. But of course, we also provided coverage of other forms of militant struggle, such as the squatters’ movement and actions against biotechnology, for example, and we always placed a great emphasis on solidarity with political prisoners and prisoners of war. In addition to publishing the ATS journal and occasional info-bulletins, we also published other materials on certain occasions. For example, when the Kurdish liberation struggle led by the PKK was at its peak in 1992-93, we published a separate “Kurdistan Solidarity Bulletin”. We also produced pamphlets on various guerrilla organizations, such as the RAF and the RZ, to distribute at political events. Our ideas have always been much larger than our budget, however, and many projects never made it off our harddrive and onto paper. Such unfinished works include “Fire And Flames: A History Of The German Autonomist Movement”, a book which we translated but were unable to publish. Several pamphlets as well were never completed, usually due to a lack of funds. Without dwelling upon the collapse of the “real existing socialism” and so on, it goes without saying that the political situation changed dramatically during the 1990s. This had an effect on our publication as well, in that most of the movements which formed the bulk of our content in the early-1990s had either disbanded or disappeared by the mid-1990s. Most of the armed left in Europe gave up the fight, and scores of national liberation movements signed “peace accords” which brought guerrilla struggle to an end in many parts of the world. These changes, as well as our eventual shift to online publishing, brought about some changes in the work of Arm The Spirit. It was never our intention to become solely an online information collective. There are many contradictions and limitations involved in using the internet, such as the lack of access by many groups and organizations outside the metropoles, not to mention the fact that political prisoners cannot participate online. But being consistently active on the internet for several years has helped us to establish new contacts and solidify others. And on some occasions, the effects of our work have been felt well outside the narrow confines of the radical-left. For example, immediately after the MRTA unit “Commando Edgar Sanchez” took over the Japanese ambassador’s residence in Lima in December 1996, in one of the most daring guerrilla actions of the decade, we immediately set up an English-language solidarity site, intending to provide news and updates on what we expected to be a very short-lived event. As the weeks went on, however, our site became an important source of information and attracted tens of thousands of visitors, “thanks” in part to exposure in the capitalist media (CNN, The Wall Street Journal, etc.). Now, of course, web sites devoted to revolutionary movements are all over the Net, but at that time such sites were still relatively new. As ATS enters the year 2000, our aim is to continue on with our work as much as possible. We slowly have resumed hardcopy publishing, while at the same time maintaining our online presence. We are also looking forward to continutng our cooperation with other projects, such as Antifa Forum, a collection of groups providing information orr militant antifascism. With this issue, the first in over 5 years, we had to make a hard decision of what to include. We easily could have filled a couple hundred pages but that was logistically impossible, so we decided to focus on a narrow selection of documents and information on and from European political prisoners and guerrilla organizations. In a way this is a return to our roots as we’re the only group to be publishing this kind of material in North America. In particular we felt it was important to publish the RAF’s final communique and related documents, as well as ETA’s return to armed struggle. We hope to have another issue out by the summer and in it we’ll publish material that we had to leave out of this one. This next issue will focus on political prisoners in the U.S., the guerrilla struggle in Colombia, the splintering of the Kurdish national liberation movement and several perspectives on the Irish “peace process”. We hope that our distribution and translation of news and political discussions is useful for the left in North America. Information is only power if it is put into use. If movements continually pass on their histories and their discussions, then we can avoid having to re-invent the wheel as new high points of political activity arise. Most importantly, we plan to continue to provide a non-sectarian forum for a variety militant movements and struggles, from a variety of perspectives and locations, based on the slogan “Solidarity Is A Weapon!”.